Sunday 21st June 2015 – Father’s Day, a day to show all the amazing daddies out there just how much they mean to us and spoil them just a little! 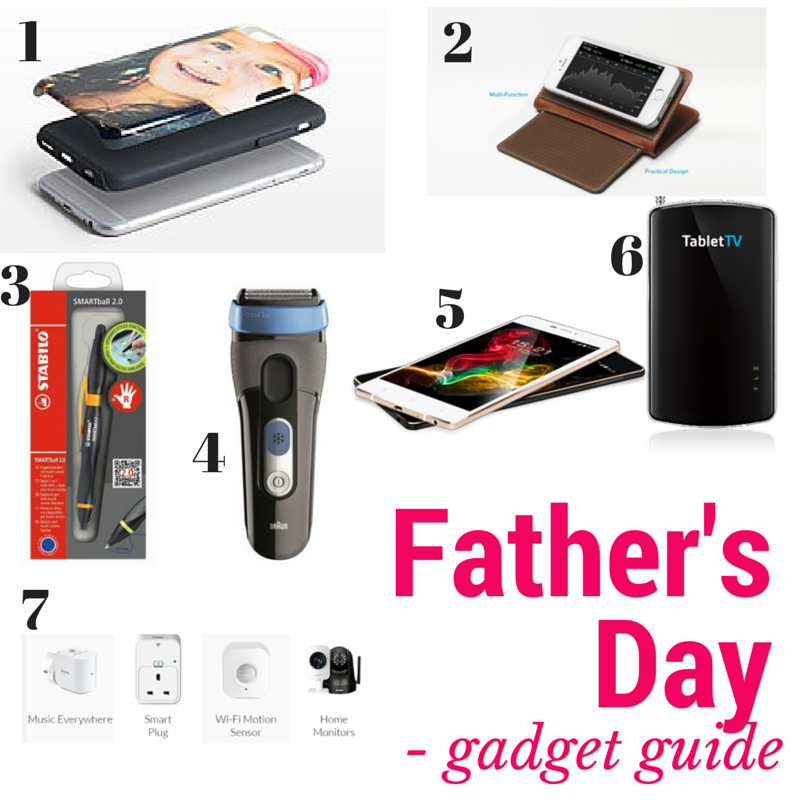 I am sharing with you my Father’s day gadget guide today, we all know dad’s love a good gadget – a new toy to play with they make a fab gift. Tomorrow I’ll be sharing another gift guide with ideal gifts from younger children but today we are all about the gadgets! Photo phone case – these look so cute the personal touch is always a winner and now dad can be reminded of his special little people everytime he looks at his phone which in most cases is 20000 times a day! Pear Peel Dual Phone case – channel your inner geek with this phone case great for on the go working dads who need two phones. Stabilo smart ball pen – you’ve heard of a smartphone and now we have a smart pen, allowing you to write but also use on your tablets and smart phones, the ultimate pen for a gadget lover. BRAUN Cool Tec shaver – A revolutionary new dry face shaver that takes the heat out of shaving to avoid irritation – Dads will love this! Kazam – I wrote a review about the Kazam tornado 348 not long ago, a great device and one of the worlds slimmest smartphone, would be ideal for any gadget loving father. Tablet TV – Let dad turn his tablet into a TV and watch the sports in peace for the day, thats what we plan to do with ours no more Saturday afternoon arguments over the footie woop, this gift is going to be appreciated by all in our household. D-link products – make your home smart with these cool gadgets with networking, security, surveillance and home automation you can make your home more in tune with you. What do you think? Hope I have given you some great ideas for Father’s Day, if you have any other gadget idea’s I’d love to hear them! Disclaimer: I was sent samples of the above products to try out for this guide. Gadgets are the way forward for men I think, Mr F loves all things techy! !